The former VC Padma said there were many who never had any access to education. She quoted her own example and recollected how painstakingly she succeeded in accessing higher education and becoming an IAS officer. Referring to the life and achievements of stalwarts like C Rajagopalachari, Romulus Whitaker and Nelson Mandela, she urged graduates to always look on the bright side of things. PhD, medals and cash Doctor of Literature (honoris causa) was not conferred on anybody during the 37th convocation of Mangalore University. As many as 149 research scholars were conferred PhD degrees in Arts, Commerce and Science fields. Out of the 149 scholars, 79 were men and 70 were women. A total of 29,101 candidates were conferred various degrees. Among them, 9,725 were men and 19,385 were women. As many as 5,471 students were conferred Master’s degrees while 19,923 students, including 12,920 women, were awarded bachelor’s degrees. As many as 34 medals and 98 cash prizes were shared by 132 candidates in five faculties. Women graduates (113) outnumbered the men. Due to fund crunch and rising prices of gold, many gold medals had been converted to cash awards. 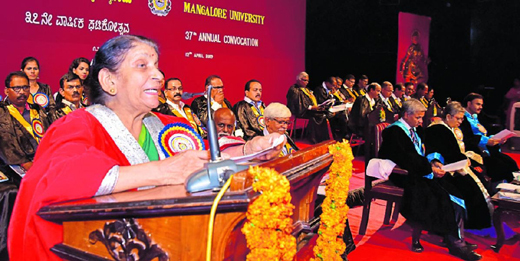 Mangalore University Vice Chancellor In-charge Dr Kishori Nayak presided over the convocation. Mangalore University Registrar A M Khan and Registrar (Evaluation) Prof Ravindrachari were present. Sumalatha S secured first rank in MSc (Chemistry) degree examination and bagged three gold medals and a cash prize. Sowmya K A, a student of the Mangalore University Post graduation centre at Chikkaluvara in Somwarpet, secured highest aggregate marks in MA (Kannada). She bagged one gold medal and five cash prizes. Speaking to media, Sowmya said that she aspires to be a professor and would pursue her research. Leo Surin, who completed his postgraduation at Mangalagangothri campus, bagged two gold medals and a cash prize for scoring highest marks in MA (Sociology). Hailing from Jharkhand, he was unaware about local languages. Yet he could achieve well in studies due to the cooperation from his classmates. Ashwini Jain, a postgraduate student of Mass Communication from Alva’s College, too, bagged two gold medals and three cash prizes. Rusagara Jean Bosco, Dukuziyaturemye Pierre, Nkurunziza Jean Baptisite, Mutamuliza Eularie, Luberwa Alex and Dusaidi Odette Gasengaire from Rwanda, were conferred PhD in MBA. They comprised the first batch of international research scholars in Mangalore University, who were sponsored by ICCR. The research scholars said that the Mangalore University offered them a high standard of in house development and study facility.